Caveat: I figured out I was going to be an English major around the time I started to read — reading and writing are my two major talents, besides being pretty good at Skee-Ball. But my choice was solidified once sophomore year started and I got a sampling of how killer the English professors are here. Class sizes are usually quite small (English classes have either a 15:1 or a 24:1 student-to-professor ratio) and that means professors have more time to give you individualized attention. Each professor has office hours where you can go in and talk about whatever’s due soon, or just check in. And these people aren’t just amazing thinkers — they’re published writers and experts in their respective fields. My Ulysses seminar professor, Tom Lewis, has written and directed TV documentaries that have been nominated for Emmy awards; Linda Hall, with whom I took a cultural criticism writing class, has written for Vogue and New York magazine. Next semester I’m taking the senior advanced fiction workshop with Steven Millhauser, who just had a story in the New Yorker. Needless to say, you’ll be learning from the best here. 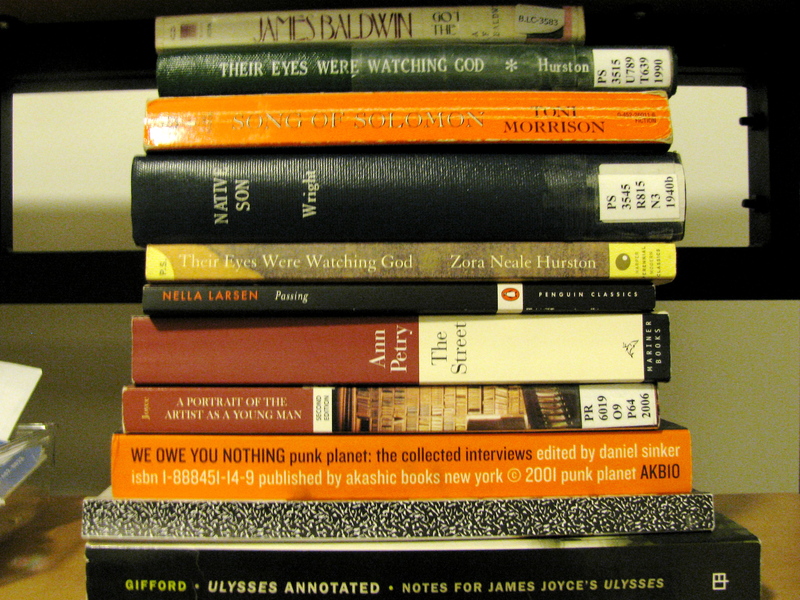 Be prepared to read upwards of six or seven novels in a typical semester-long literature class. Taking multiple English classes inevitably results in a hefty amount of reading per night — a few hundred pages a week, maybe — so staying on top of English work requires diligence and careful plotting. Lucky for you, the courses offered each semester are quite diverse, from Milton to Willa Cather and everything in between. I’ll go ahead and say there aren’t many writers, genres, eras, literary forms or literary movements that go overlooked. Sample course titles for next spring: the Victorian Illustrated Book, Queer Fictions, the Wild(e) ’90s (that’s the 1890s of course), Environmental Journalism, Chekhov, American Gothic Fiction, Food Literacy. Some of my reading this semester, Punk Planet book not included. The first big essay I ever wrote was my senior year of high school; it was a five-page comparison of Frankenstein and Wuthering Heights, and boy, did it stink. “Get ready,” said my AP Lit teacher, “It’s going to be like this all the time in college.” He was right! There’s a lot of straight-up word hustling going on in English courses, but you won’t be assigned one-size-fits-all papers every time. I’ve had to write everything from blog-style reading responses to 15-page research papers. Right now my African-American Novels professor is all about the two-page assignments — long enough to get the point across but short enough to have to choose the right words and topic. So be prepared for everything, including the 25 – 50 page capstone writing project your senior year, and don’t worry — you’ll have plenty of professors who will help you with style and grammar and all that tasty mumbo jumbo. Your future is going to be AMAZING!!! Hmm. That subtitle is a little heavy on the exclamation points, but still, it’s the truth. If you decide to be an English major, you might get a lot of people either wrinkling their nose and telling you that you won’t get a job, or else assuming you want to be a teacher post-graduation. I’m of the mind that the English major prepares you for all kinds of jobs because it teaches you how to communicate ideas. Communicating ideas well happens to be a very useful vocational skill; plus, we’re all regressing from phone calls and meetings to emails and texts, so writing skills are essential. Plus, Skidmore is a liberal arts school and encourages all kinds of academic exploration during undergrad, so don’t be shy about majoring in a subject for which you have a passion. The English department brings amazing writers to campus for readings and Q&As, both internationally known authors like Lorrie Moore and Dave Eggers and home turf heroes like Daniel Swift and Greg Hrbek. These department events are usually accompanied by the renowned Skidmore Catering fruit and cheese platter. It is sumptuous. Splendid. The peak of luxury. Perfectly ripe grapes, cellophane-tipped toothpicks, Muenster cubes AND cheddar cubes. There’s nothing better than walking away from an Allan Gurganus reading with a swirling brain and a pocket full of cheese — that really sums up the English major experience for me. This entry was posted in Offices & Resources, Personal, Videos and tagged english major, skidmore college, skidmore english, videos on November 16, 2011 by Molly O'Brien.